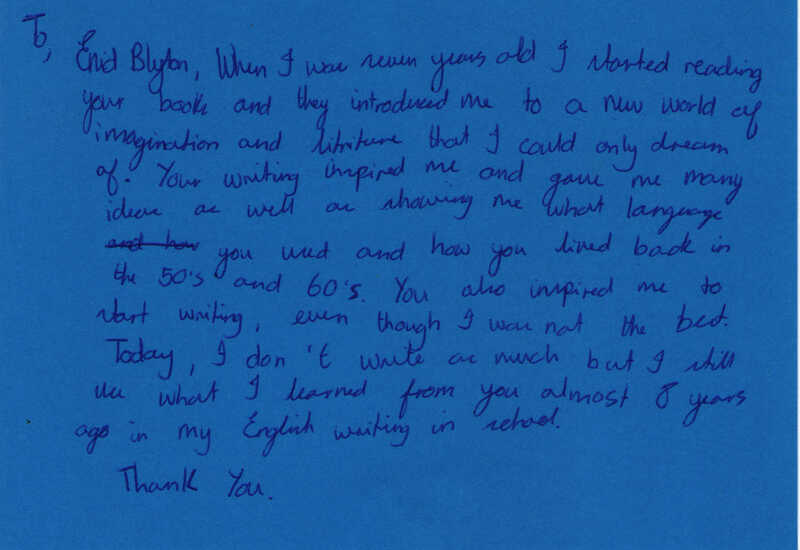 To Enid Blyton, author, poet, teacher. From Elin Griffiths-Warner. When I was seven years old I started reading your books and they introduced me to a new world of imagination and literature that I could only dream of. Your writing inspired me and gave me any ideas as well as showing me what language you used and how you lived back in the 50s and 60s. You also inspired me to start writing, even though I was not the best. Today I don’t write as much but I still use what I learnt from you almost 8 years ago in my English writing in school. author, poet, teacher. Born 1897, died 1968. More information about Enid Blyton.